Nene Valley's Kimberly Miller in action in the 300m. 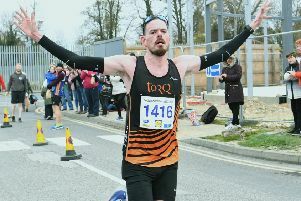 Nene Valley Harriers showed that ‘Sensational Sundays’ aren’t just reserved for Olympians as they pulled off a fine East Anglian League victory at their home track. With first place finishes for the senior men and ladies along with the Under 15 and Under 17 boys, Nene Valley were the dominant club, seeing off the challenge of a strong Norwich team. Eleanor Smith throwing the discus for Nene Valley Harriers. It was an event which featured a number of exceptional performances, and Under 15 Lee Addison led the way with three memorable wins. Addison won the 100m in 12.0, the 200m in 24.8, but saved his best - a winning leap of 1.80m in the high jump - until last to move up to fourth in the national rankings. And that’s a fine effort considering he only took the event up seriously this season. Jack Roffe also secured an Under 15 treble winning the shot, discus and hammer. Dave Bush impressed for the senior men with victories in the 110m hurdles, B high jump and B javelin. The versatile 24 year-old took part in five different disciplines, scoring heavily for the Harriers. At Under 17 level Ronald Rawlins pulled off a fine treble winning the 100m, 200m and long jump, while Kai Harrison and Charles Hughes dominated the throws. Freddie Fraser starred for the Under 13 boys winning the 100m in an impressive 13.1. He also won the 75m hurdles. Lilly Hughes and Alex Pullen won the A and B 100m for the senior ladies, both with times of 13.0. Pullen also took the B 200m. Andrea Jenkins was a winner in the discus, javelin and hammer, while Tierney Augustine won two throwing events. Emily Maltby was another multi-eventer who came good with firsts in the 100m hurdles, long jump and triple jump. Star of the show for Peterborough AC was Elizabeth Taylor. She broke her own club record for the Under 13 girls 200m for the third time with a rapid 26.8, then won the 70m hurdles with a PB of 11.8 before charging to victory in the 100m with another PB of 13.2. She ended the day with a win in the 4 x 100 mrelay. n Nene Valley’s Hannah Molyneaux and William Hughes were both winners in the Northern Athletics Championship in Middlesbrough at the weekend. Molyneaux won the Under 17 shot with a throw of 13.75m while Hughes was first over the line in the Under 17 200m, clocking 22.04.